A personal representative's deed is a probate instrument used to convey real property in estate administration. It is one in a class of fiduciary instruments that is named after the capacity of the executing party. A personal representative is the fiduciary assigned by the district court to administer a decedent's estate through the granting of letters (testamentary or of administration, depending on the testacy status of the decedent). Unless otherwise provided in the decedent's will, the PR has the power to sell or convey real property without a hearing, excepting certain circumstances (ORS 114.325). A PR must execute a deed in order to distribute real property from the estate pursuant to a judgment of final distribution. A PR may also be used to carry out a sale. The sale of real property may be necessary to pay spousal support, child support, the elective share of the surviving spouse, or claims and expenses of administration. When signed by the executing PR and acknowledged in the presence of a notary public, the PR deed transfers all the decedent's interest in the subject property at the time of his or her death to the purchaser or successor in interest. When recorded to effect distribution, the PR deed updates the chain of title and legitimizes the successor's interest. A PR deed typically carries no warranties of title. The PR deed incorporates information regarding the probated estate, such as the personal representative's name, the name of the decedent, the county in which circuit court probate is taking place, and the case number assigned to the estate. To property vest title in the purchasing party or successor in interest, the deed must contain the grantee's full name, mailing address, marital status, and manner of vesting. Any documents affecting an interest in real property requires the full legal description of the subject property, or must reference the book and page, document number, or fee number of public record of the county where the description may be found (See ORS 93.600). Oregon law also requires a mandatory statement on all instruments for conveyance of fee title to real property (see ORS 93.040). In compliance with ORS 93.260, the form must reflect the address to which tax statements on the subject property should be sent. Submit the completed, signed, and notarized PR deed in the recording division of the appropriate county clerk's office. Include all appropriate attachments, depending on the situation; these may include a copy of the relevant court order authorizing sale or distribution, if applicable. The information provided here is not a substitute for legal advice. 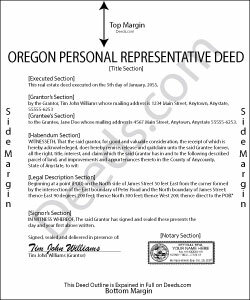 Consult an attorney licensed in the State of Oregon with questions regarding PR deeds, as each situation is unique.